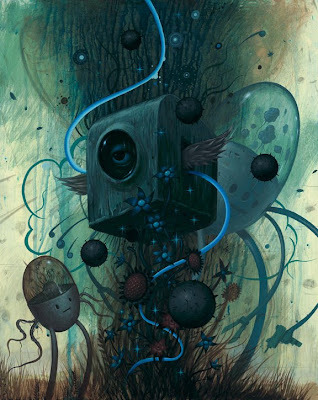 I just love these super weird egg-shaped robots by Jeff Soto! Who knows what the heck they're doing with their multiple arms as they grow plants and flowers out of their body while wielding a paint rollers, guns and clippers? I sure don't, but I don't care because they're just so dang cool. The silkscreen print (above) is much brighter than Jeff's current work (below) and was originally created for Juxtapoz magazine. The painting below, entitled "Floating In the Garden" is acrylic on wood and was created last year. 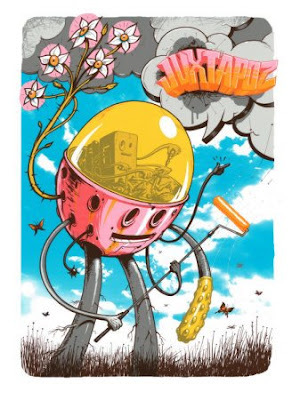 The Juxtapoz silkscreen still available through their online store. Jeff's work was featured in the July/Aug issue of Juxtapoz in 2004. Top image was taken from Juxtapoz. Bottom image was taken from Jeff's website. can't wait to see you in May!